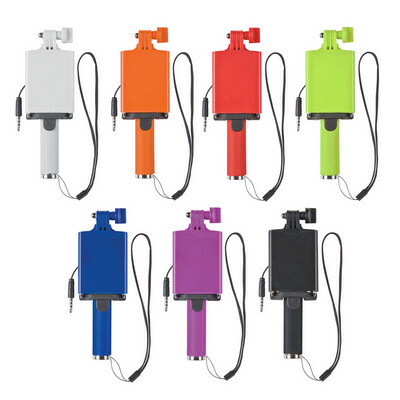 Pocket size retractable mini selfie stick which will securely hold almost any smart phone. Has a cable that plugs into a phone audio jack which supports both Android and iOS allowing photos to be taken by pressing the conveniently located button on the handle. A lead time of 10 - 15 working days applies to this product. Colours: White, Orange, Red, Lime Green, Blue, Purple, Black. Dimension: Retracted: H 138mm. Print Description: 38mm x 25mm (two colour max). Print Type: Pad Print. Packing: Loose packed. Less than minimum quantities are not available for this item. MOQ applies per colour on this item. Telescopic selfie stick which will securely hold almost any smart phone. Extends to one metre in length and retracts to a compact 235 mm when not in use. Has a cable that plugs into the phone audio jack which supports both Android and iOS allowing photos to be taken by pressing the conveniently located button on the handle. A lead time of 10 - 15 working days applies to this product. Colours: Black. Dimension: Retracted: H 337mm. Print Description: 44mm x 9.5mm (one colour). Print Type: Pad Print. Packing: Gift Box Less than minimum quantities are not available for this item. MOQ applies per colour on this item. Telescopic selfie stick which will securely hold almost any smart phone. It extends to 517mm and retracts to a compact 145mm when not in use. Alto has a cable which plugs into the phone audio jack and supports both Android and iOS allowing photos to be taken by pressing the conveniently located button on the handle. Colours: White, Orange, Red, Bright Green, Light Blue, Dark Blue, Black. Dimension: H 145mm x W 42mm x 25mm (closed). Print Description: 65mm x 10mm. Print Type: Pad Print. Packing: Loose packed. 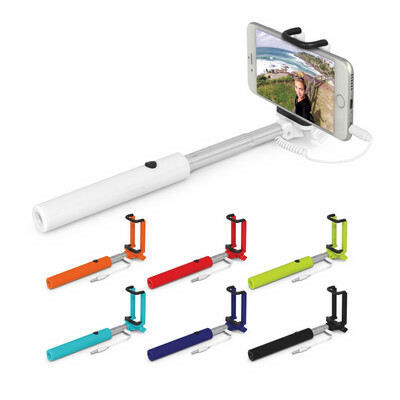 Telescopic selfie stick which will securely hold almost any smart phone. It extends to 608mm and retracts to a compact 178mm when not in use. Metron has a cable which plugs into a phone audio jack and supports both Android and iOS allowing photos to be taken by pressing the conveniently located button on the handle. It features a large flat back panel on the holder which is designed as a branding 'billboard' to ensure logos are clearly seen when the selfie stick is in use. Colours: White, Black. Dimension: H 178mm x W 47mm x 27mm (closed). Print Description: 50mm x 30mm. Print Type: Pad Print. Packing: Individual Boxes.